These baked pork chops are the best oven baked pork chops ever! They are so easy to make, super juicy, and flavorful. Rub them with a few pantry staple spices and pop them into the oven for 18 minutes and dinner will be ready! Let's give it up for easy and delicious pork chop recipes! This one is my personal favorites and the one I go back to time and again. The pork chops always turn out juicy and are so flavorful. After you make these baked pork chops once you'll make them again and again. The recipe is really simple and is a great one to keep in your back pocket for when you need dinner stat or just can't figure out what to make tonight. I serve these with a big salad and some veggies roasted in the oven at the same time as the pork chops. It makes for a quick and easy dinner. 100% juicy pork chops. ← truth! 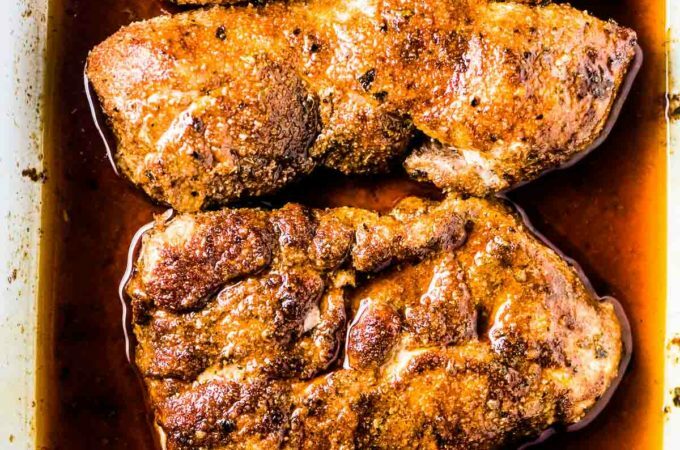 With these chops, in just over 20 minutes you can be sitting down to a healthy and delicious dinner. The easy spice rub, made with spices you probably have in your pantry right now, gives tons of flavor. Pork chops are a budget-friendly protein option. Knowing how to cook them so they don't dry out will make your dinners less expensive and more delicious. 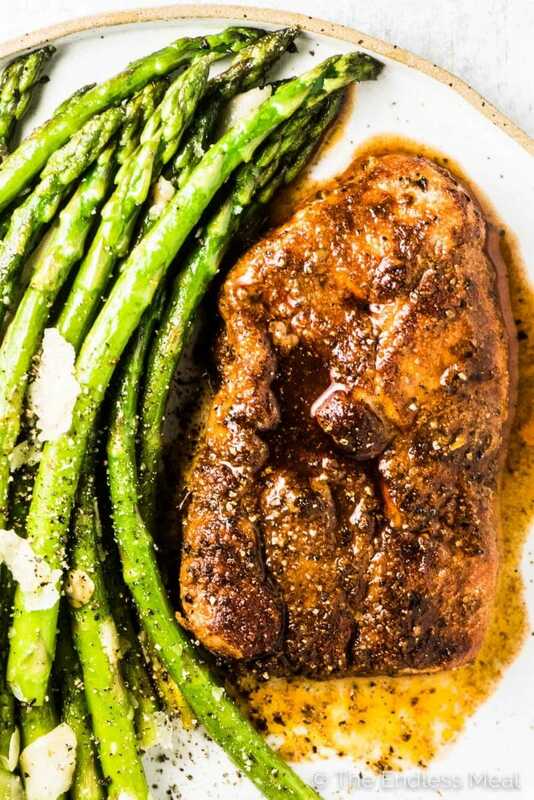 Easily made with bone-in or boneless pork chops. Choose whichever you like best! The pork chops create their own bit of sauce which you can spoon over the veggies on your plate. It's delicious. 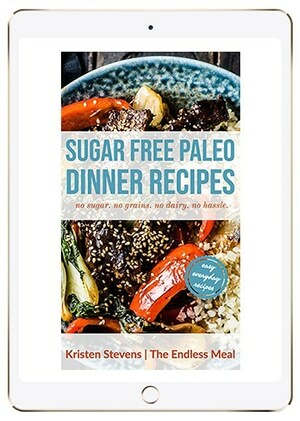 They are low-carb, gluten-free, paleo, and Whole30 compliant! Making pork chops in the oven is super easy. I like cooking them in the oven as I can cook the veggies at the same time. 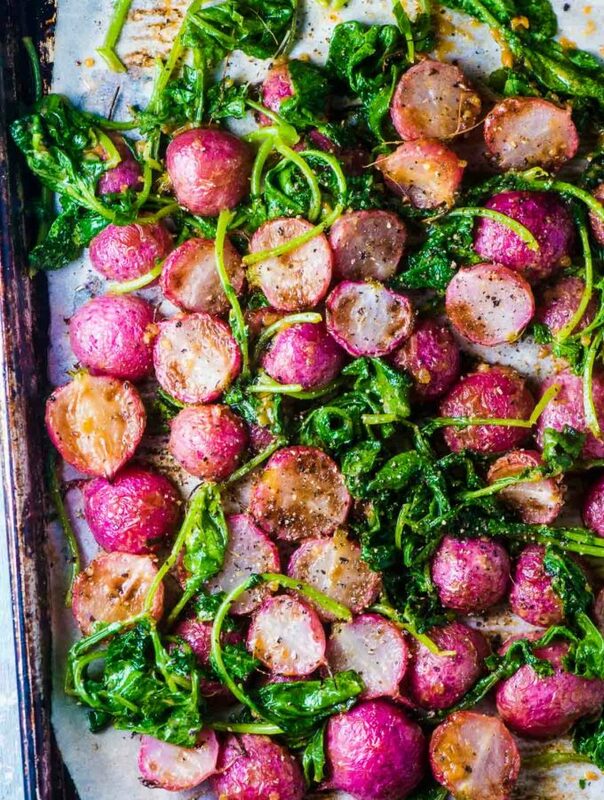 The trick here is to choose a baking dish that's not too big. You want the pork chops to be fairly snug so that their juices don't evaporate while cooking. It makes the chops juicier. Rub some olive oil and spices over the pork chops. Pop them into your oven. That's it! Seriously, these are easy pork chops at their best! The biggest ‘trick' to making oven baked pork chops is to not overcook them. Since pork chops are lean meat, they will dry out if you leave them in the oven for too long. But don't worry, here's an easy way to know exactly how long you should cook your chops. In a 400 degree oven, boneless pork chops need to cook for 7 minutes per 1/2 inch of thickness. If you are using bone-in pork chops, add an extra minute for each 1/2 inch. If you're new to making roasted pork chops, the best way to tell if they are fully cooked is to use an instant read meat thermometer. Pork should be cooked to an internal temperature of 145 degrees Fahrenheit. I use my meat thermometer to make sure I don't overcook the meat. Which spices are the best with pork? It's a basic spice rub that has so much flavor! 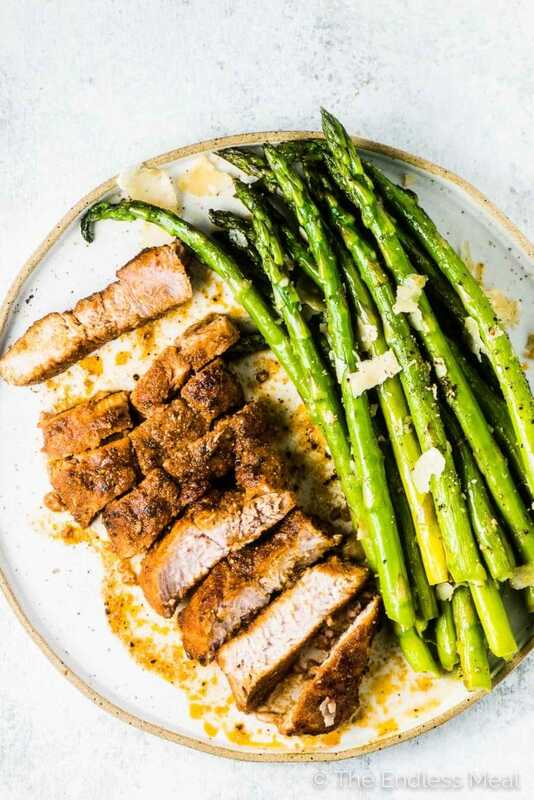 Is this baked pork chop recipe healthy? Yes! Pork chops are lean meat and are low in calories and fat and high in protein. 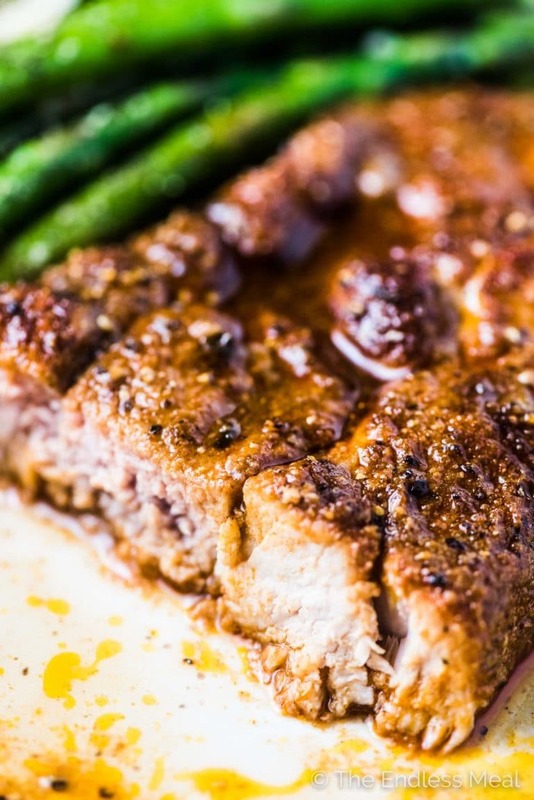 This is a healthy pork chop recipe as it is made without any sugar. Pork recipes will often call for sugar, but it is really not necessary. There is no reason to take a healthy cut of meat and add a bunch of sugar to it. These chops are sugar-free and delicious. They are also low-carb, gluten-free, paleo, and Whole30 compliant. 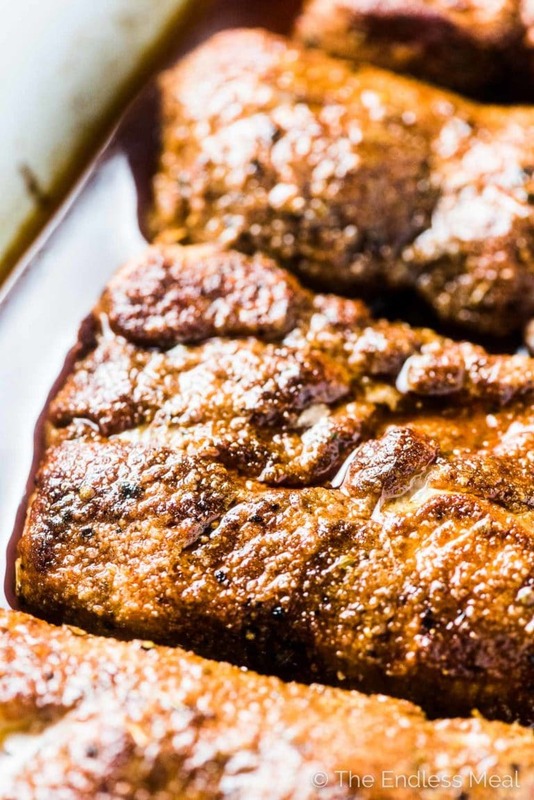 These baked pork chops are the best oven baked pork chops ever! They are so easy to make, super juicy and flavorful. Rub them with a few pantry staple spices and pop them into the oven for 18 minutes and dinner will be ready! In a small bowl, mix together the paprika, onion powder, garlic powder, salt, pepper, and oregano. Drizzle the 1 tablespoon of the olive oil over both sides of the pork chops. Sprinkle the spice mix evenly over both sides of the pork chops and place them in a baking dish. 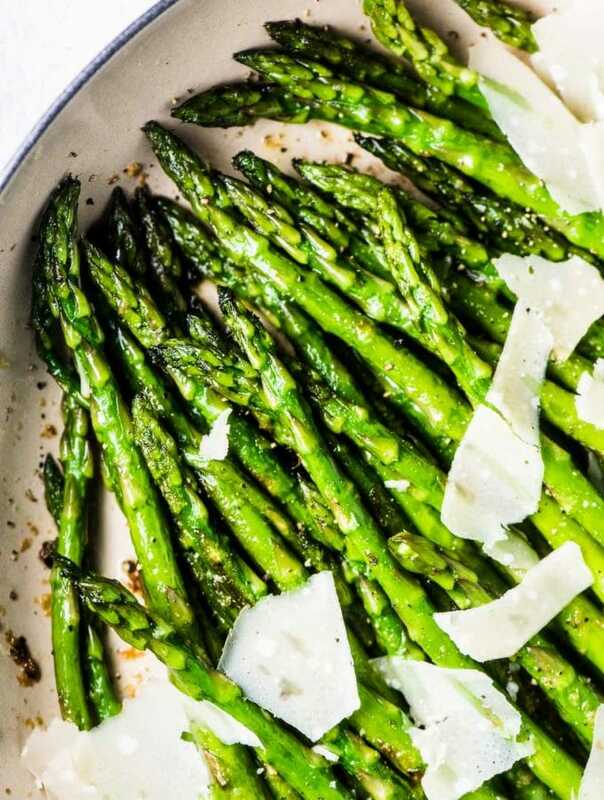 (see notes) Drizzle them with the remaining tablespoon of olive oil. Bake the pork chops for 18 minutes, or until they reach an internal temperature of 140 degrees Fahrenheit. Once you remove them from the oven, let them rest in the pan for 5 minutes before serving. Try to choose a baking dish that is just the right size for the pork chops. You don't want there to be too much room between the chops or the juices will evaporate in the oven. Bake your pork chops for 7 minutes per 1/2 inch of thickness. Add an extra minute for each 1/2 inch if you're using bone-in pork chops. I made these as soon as I saw them. You’re right they are juicy. I’ve never been a big fan of pork chops but I think I will be now. Will make them again! I made these last night and they were the best baked pork chops ever! I realize mine always came out dry because I left too much room in the pan. Absolutely delicious, thanks so much. Boy, do I love easy. And yours is such a great recipe for cooking tender juicy pork chops. 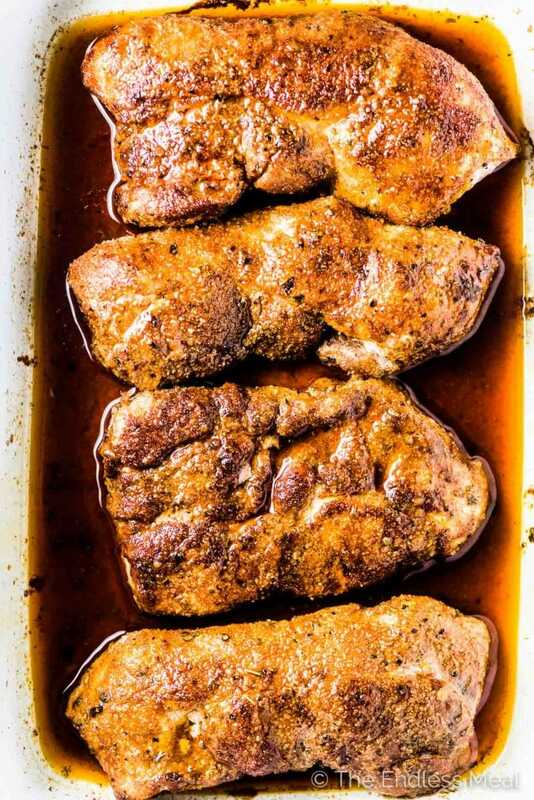 Thanks for the reminder to pull out some pork from the freezer and throw this simple recipe in the oven.